This dynamic therapy offers the combined benefit of a full reflexology treatment, plus the stimulation of all the major meridians in one half-hour session. The concept uses a vacuum boot foot reflexology treatment together with a vacuum cupping treatment sequence along the acupuncture meridians. Discolouration caused by the boot treatment highlights areas of reflex and meridian congestion. The therapist can "assess" what is reflected. The Dougans International Vacuflex Concepts is unique in the field of complementary therapies. Through the use of modern technology, but without losing the human touch factor, Vacuflex Concepts maximises the body’s own healing potential by combining two of the world’s ancient and powerful methods of holistic practice; Reflexology and Meridian Therapy (Acupuncture) into one treatment. Patients can enjoy the combined benefit of a full reflexology treatment, plus the stimulation of all the major meridians in one half-hour session. 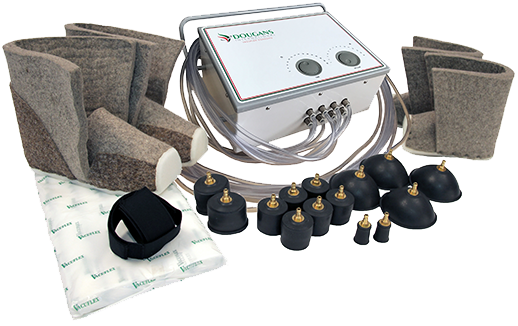 The Dougans International Vacuflex Concepts uses a vacuum boot foot reflexology treatment together with a vacuum cupping treatment sequence along the acupuncture meridians that transverse the whole body. Dougans International has been selling the Vacuflex Concepts to qualified therapists and practitioners around the world for more than 25 years. In beginning of 2013, a new, modernized, light-weight and maintenance-free system was launched.